Now it’s time to add some stitch! Layer up your book wrap with wadding and backing and baste as you normally would (we just tack with some large hand stitches). We’re going to quilt by hand (we’re hoping for summer sun so we can sit outside and sew! ), but first, let’s choose some threads. Look back to your colour palette and your thread collection. What do you have that might work? Perhaps you want your thread colour to blend with the fabrics, or perhaps you want to introduce a contrast colour? Audition some contenders by laying them across your work. We’re using single strand cotton for our quilting. Ours is hand dyed, but commercially dyed threads will work just as well. Let’s start with quilting the appliqué areas. 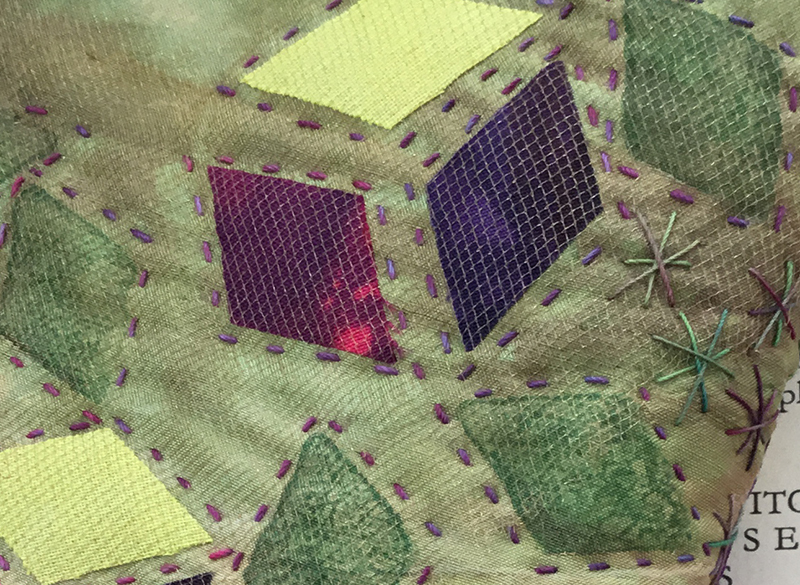 The appliqué is raw edge and if you’re concerned those edges might lift when you use your book in the future, you might consider adding a layer of very fine net. This won’t add substantially to the bulk of the layers, but it will help protect the edges of the shapes from wear and tear. With the net in place, it’s easy to quilt around each shape working a line of running stitches just outside the shape. 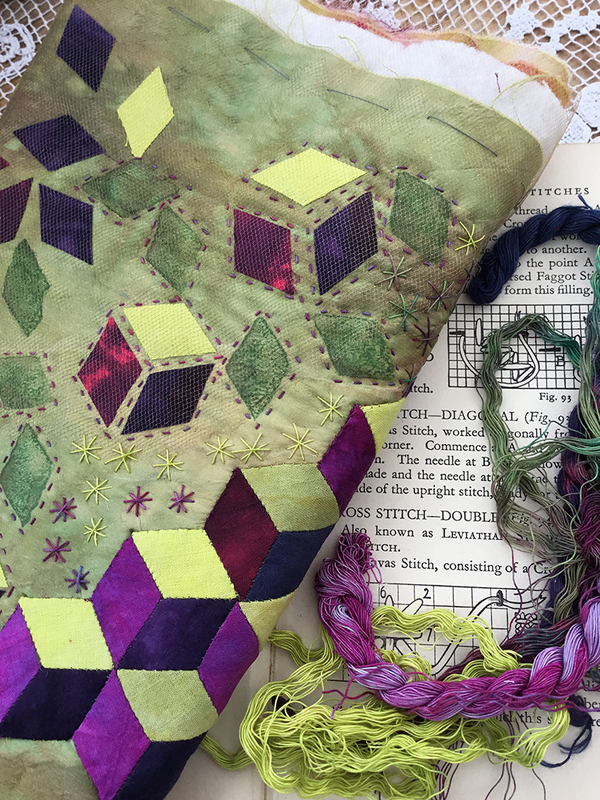 A running stitch is simply a straight stitch, and maybe you’ll want to explore what else you can do with a straight stitch. Perhaps you’ll stitch bars over the edge of the shape, or long stitches that completely cross the shape? Long stitches can be susceptible to catching, so you can couch down the thread of a long stitch if need be. So we’ve suggested 1 stitch, but we’d like you to also choose another favourite stitch to use. 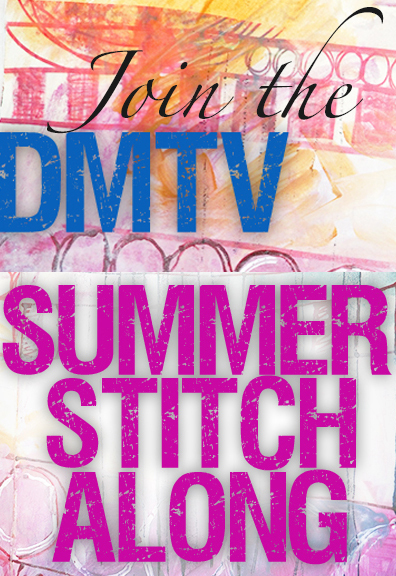 Maybe you’ll use cross stitch, fly stitch, detached lazy-daisy, French knots, the choice is yours! 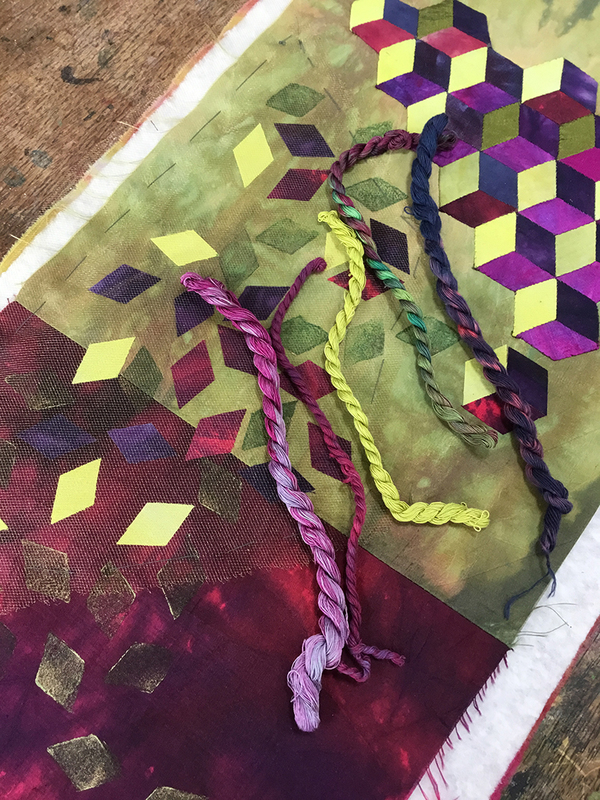 Whatever you decide, quilt the printed and appliquéd areas, but leave the pieced section for now, we’ll tackle that next time.